When a team in any sport goes on a run of sustained success, the level of interest – not to mention scrutiny – amplifies with each additional triumph. It’s in part due to this attention that those clubs that achieve such rare feats of consistency are both celebrated and rare. Such is the case with the Rouyn-Noranda Huskies. 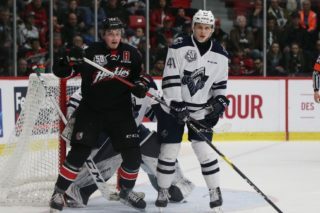 Winners of 22 consecutive games entering last weekend’s action, the QMJHL’s top club extended their run to 24 by first holding the league’s top offensive club, the Drummondville Voltigeurs, to a single goal in a 6-1 victory, then rallying from an early 3-1 deficit to defeat the 2019 Memorial Cup host Halifax Mooseheads 8-4. This is a Mooseheads squad that surrendered just seven goals in their previous eight games. Combined, the two teams had secured points in 22 straight games before stepping onto the ice at Iamgold Arena. How it began – On November 19, 1973, the Eperviers, led by a five-point night from Pierre Larouche, skated away with an 11-3 home ice win over a first-year expansion club named the Chicoutimi Sagueneens. What made it unique – This streak came during a time when high-octane offense wasn’t just common, it was a way of life in the QMJHL. The fact that any team could win 25 in a row (part of a 27-game undefeated streak) in an era where virtually any team could put a ten-spot on another team on any given night, and the inherent danger that comes with that style of play, makes this streak particularly impressive. It was a different era, to say the least. Close calls – Not too many, to be honest. One of the benefits of scoring a league record 620 goals in the regular season generally means that even when the defense takes a night off, the offense will pick up the slack. During the streak, the Eperviers notched 10 goals or more on 15 occasions, including an almost absurd six straight games of 12 goals or more! The top line of Pierre Larouche, Michel Deziel and Jacques Cossette would combine for nearly 300 points during the streak. There were four one-goal games along the way. How it ended – Fittingly, with a ton of offense. The Eperviers travelled to Cornwall to take on the Royals on January 31, 1974 and wound up on the wrong end of an 11-5 score. Gary MacGregor scored six of his 100 goals on the season in this game for the Royals. Did I mention this was a different era? What happened next? – The Eperviers set league records of 58 wins and 117 points on the season. Though the latter mark has been surpassed, the win total has been matched but not overtaken. 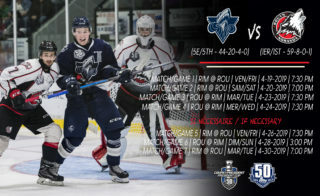 The club waltzed through the first two rounds of the playoffs before falling to the Quebec Remparts in a six-game final. How it began – On November 22, 1995, six different players – including star forwards Martin Menard and Pavel Rosa – found the back of the net in a 6-3 victory over the Drummondville Voltigeurs. What made it unique – Much like this year’s Huskies, this one is our first winning streak that was not part of a longer undefeated run. Unlike the Huskies, this one occurred during the pre-shootout era. Ties were still on the books. As was the case with Sorel, the Olympiques avoided them for the duration of the streak. Close Calls – Although they avoided ties, they did not avoid overtime. Two of the closest scrapes with the end of the streak came early on. First, on November 26th, it took a Jean-Guy Trudel overtime goal to emerge with a 4-3 victory over the Victoriaville Tigres. Then, on December 1st, the Chicoutimi Sagueneens rallied from a two-goal hole to force overtime before Menard would end it in favor of Hull 4:26 into the fourth period. How it ended – This one ended in a rather unexpected fashion. 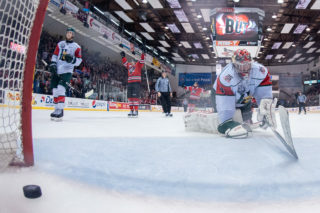 It ended at the hands of the Halifax Mooseheads, a second-year expansion franchise. 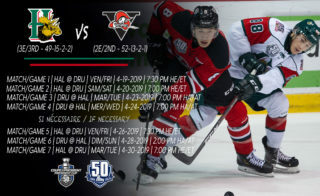 Though they would finish 40 points behind the Olympiques in the final regular season standings, it would prove irrelevant as a pair of goals by Mathieu Sunderland, a shorthanded tally by Jody Shelley and a 34-save effort from Jean-Sébastien Giguère would play major factors in the Mooseheads’ 6-4 win in Hull on January 28th. Of all the teams on this list, the Olympiques are the only team to see their streak end at home. What happened next? – Another dubious distinction for the Olympiques is the fact that they are the sole team on this list to not finish with the season with the top regular season record in the league. 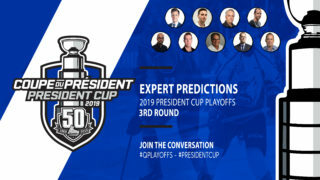 Though they still churned out an impressive 52-win, 106-point campaign, they still wound up eight points behind the eventual President and Memorial Cup Champions, the Granby Predateurs. The Olympiques would advance to the league semifinals that spring before falling to the Beauport Harfangs in five games. The following year they would earn redemption by capturing first the President Cup, then the Memorial Cup on home ice. How it started – On October 17th at Harbour Station, Jonathan Huberdeau opened the scoring while Mike Hoffman provided the game winner 12 seconds into overtime in a 3-2 Sea Dogs triumph over the Moncton Wildcats – a team that will be mentioned a few more times in this article. What made it unique – Like the current Huskies streak, this one took place in the post-shootout era. One well-placed shot in a shootout, or an off night for a goaltender in the one-on-one competition, can spell the end of not only a winning streak, but a potential undefeated streak. Unlike the landscape of the league pre-2005, for a team to put together a lengthy undefeated streak, it’s “get the win or nothing”. Close calls – As we saw above, this is a streak that was almost over before it began, the Dogs needing to erase a one-goal deficit to force overtime in win number one. It also came within two seconds of coming to an end on October 30th in Baie-Comeau. Michael Kirkpatrick’s two goals, one at 19:58 of the third period and the other in the fifth round of a shootout, would earn Saint John a 3-2 win. The Dogs would also need a shootout to run the streak to 14 games in Drummondville on November 20th. How it ended – The Sea Dogs travelled to (shocker) Moncton on December 13th looking for consecutive win number 23. After taking a 2-1 lead early in the second period, the Wildcats poured in six consecutive goals, eventually emerging with a 7-3 victory. This makes the Sea Dogs the only squad on this list to start and finish their streak against the same team. What happened next? 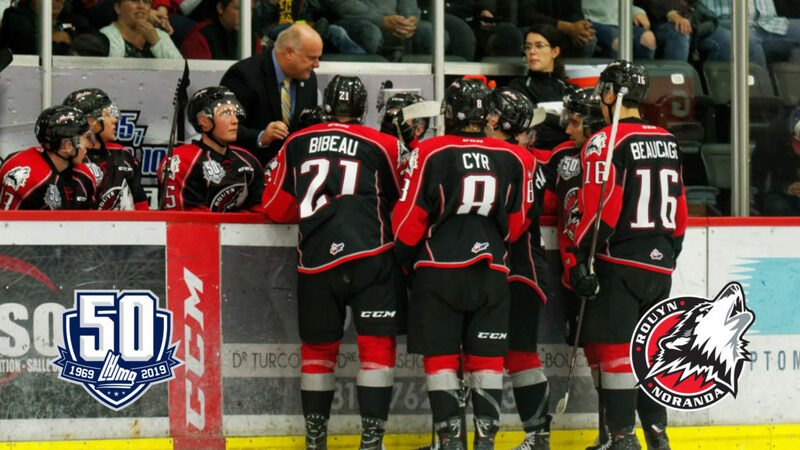 – Head coach Gerard Gallant steered the Sea Dogs to a league-best 53 wins and 109 points in the regular season. In just their fifth season in the league, Saint John would then advance to their first President Cup Final where they faced – wait for it – the Moncton Wildcats. In what is to date the only “Q” championship contested between two clubs from New Brunswick, the Wildcats defeated the Dogs in six games. For their part, the Sea Dogs would go on to take the next two Jean-Rougeau and President Cup titles and add a Memorial Cup triumph in 2011 for good measure. 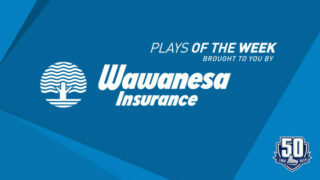 UPDATE – The Huskies made it 25 wins in a row on Wednesday, March 6th, when they topped the Shawinigan Cataractes.